Perfect for delighting at any occasion, this harmonious arrangement is guaranteed to make a lasting impression! 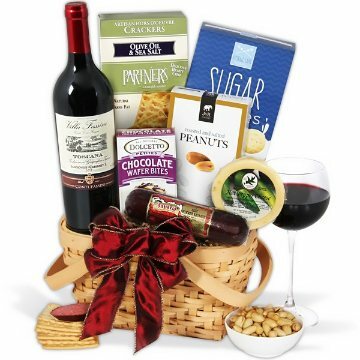 Inside a beautiful handled basket, your recipient will discover a well-balanced Cabernet Sauvignon, which our experts have paired with a classic assortment of tasty gourmet snacks. Complete with an authentic German summer sausage, jalapeño-speckled Wisconsin cheese, and crisp artisan crackers, this elegant gift is one that's impossible to resist! This gift includes the following: Sangiovese Cabernet Sauvignon by Villa Fassini - 750 ml., Hors d'Oeuvre Deli Style Crackers - 4.9 oz., Hot Pepper Cheese Round - 4 oz., Smoked Sausage - 7 oz., Sugar Cookies - 4 oz., Chocolate Wafer Petites - .7 oz., Roasted and Salted Peanuts 2 oz.